Situated in the picturesque Hermitage Valley, with panoramic views of the Langeberg Mountains and berry orchards, Wildebraam Berry Estate (a Swellendam Berry Farm) stuns and delights visitors who come to enjoy the ‘Wildebraam Experience’: beautiful surroundings, friendly enthusiastic staff who eagerly share the intricacies of liqueur making and berry farming, and the opportunity to taste ten unique South African Liqueurs. From November to January picking your own youngberries and blackberries is and additional activity and the fun-filled Wildebraam Berry Festival takes place every year in early December. 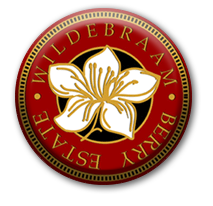 Owners Natalie and Martyn Turck have grown Wildebraam Berry Esate fron scratch in 1996 into Swellendam’s “BERRIED TREASURE” with an unwavering focus on quality and hospitality. Come and join us on our berry estate where you will be warmly welcomed in our stunning valley just outside Swellendam, and overwhelmed by our gastronomic delights! !